DeepMind, a London-based AI research lab acquired by Google in 2014, is due to move office. The company, bought for a reported £400 million, is expected to move out of its own secret office and into a new Google building next door later this year. DeepMind’s team of around 250 people is currently based in an inconspicuous building at 7 Pancras Square but they will soon sit alongside Android engineers and YouTube staff at 6 Pancras Square. 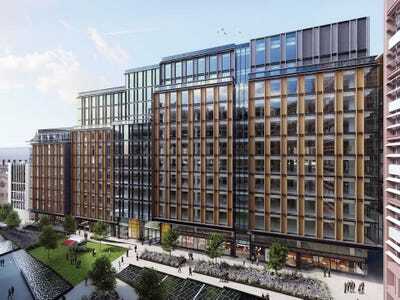 A Google spokesperson told Business Insider on a tour of the new office, which is able to accommodate 2,500 people, that DeepMind will move into 6 Pancras Square around October. Not much is known about DeepMind’s current office but 6 Pancras Square has massage rooms, a 90m running track, nap pods, and a cookery school. Cofounded by Demis Hassabis, Mustafa Suleyman, and Shane Legg in 2011, DeepMind combines techniques from machine learning and systems neuroscience to build powerful general-purpose learning algorithms. The company received attention from the world’s media in March when its “AlphaGo” AI agent successfully defeated one of the best humans to have ever played Go, which is an ancient Chinese board game. It has also been in the spotlight for the work it is doing with the NHS.